Check out the Bimini top for this Thundercraft boat! It sure is a beauty that will offer our customer excellent protection from the rain and sun while out on the water. The Sunbrella Pacific Blue canvas matches nicely with his boat decals. The are always an excellent choice for salt water use. We love to hear feedback from customers that can always result in improvement. Check out his pros and cons of his recent experience. Pros: It looks great and was easy to assemble, then install. 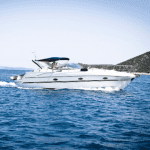 They offer Bimini tops at a competitive price while they present high quality covers. This Bimini top will block the sun and offer much needed shade. In all, this is a very nice product. Cons: This large Bimini offers great shade since it is 88” wide and 8’ long. A brace kit for such a large top is suggested. It has improved my experience. The brace adds stability while sailing through the water. The brace kit will allow our customer to keep the Bimini stored at an angle, which will keep it out of his way and free up room at his transom. We hope our customer will get to spend more time on the water enjoying his boat…and his Carver Bimini top.